EBC Ultimax 2 Front Brake Pads 05-18 Dodge Ram V6, V8 EBC Ultimax 2 Front Brake Pads 05-18 Dodge Ram V8, EBC Ultimax 2 Brake Pads 05-18 Dodge Ram V6, EBC Ultimax 2 Brake Pads Dodge Ram, EBC Brakes UD1084 Brake Pads, Brake Pads 05-18 Dodge Ram, Brake Pads Dodge Ram, Brake Pads Dodge Ram 1500, Brake Pads Dodge [EBC Brakes UD1084 Brake Pads] - $79.95 : 3rd Strike Performance, Your Source for Late Model MOPAR Performance Parts and Accessories! 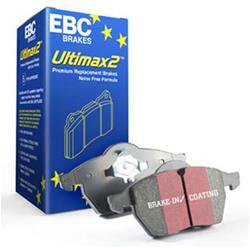 EBC Ultimax brake pads feature EBC's unique break-in coating for super-quick pad bed-in. They're manufactured from premium high-friction material—a total non-metallic pad containing ZERO steel fiber, making this a cleaner pad far less aggressive to cast iron brake rotors. EBC Ultimax 2 brake pads use a centerline slot, which prevents heat expansion and cracks and reduces brake noise. Their distinct powdercoat finish on both the pad and back plate gives lifetime resistance to corrosion and prevents moisture ingress.